By Fr. Joseph L. Thaler, M.M. Since the earthquakes struck Nepal earlier this year, Father Joseph Thaler and the Maryknoll staff have helped hundreds of people rebuild their homes. They also have assisted principals and teachers so that classrooms are stabilized and books again are available for the students. With local colleagues, Father Thaler also is rebuilding his many programs that for decades provided the people with income, health services and food for the family table. The following information and photos from Father Thaler describe the progress that has been made to normalize life since the earthquakes and aftershocks shook the country. All of this work is delivered with God’s guidance and with the support from many Maryknoll friends. Maryknoll thanks everyone for the donations and prayers that are assisting Maryknoll’s rebuilding efforts for the people of Nepal. Read more about the ways to help Maryknoll’s ongoing initiatives in the country. You can see a lot of construction when you travel around the village of Bhimtar. These are the new homes. The village of Bhimtar has nine wards and the recent construction has occurred in Ward 9. Most of the houses now only will have the side walls rise up about four or five feet. The rest of the walls will consist of light weight bamboo or wood. The fear of another earthquake exists, so the present construction is stable and light-weight to provide families with security. For the new construction, most of the people are incorporating the door and window frames from homes that were destroyed. Since the monsoon rains started to subside, we have been able to move more building supplies to the village. The trip by truck takes about four hours to reach just the outskirts of the village. The condition of the roads determines how deep into the village we can travel to deliver the supplies. Many of the people have been waiting to return to their home sites with the building materials. There is just no easy way to deliver the materials to them. So, villagers must meet us to pick up the materials and then carry the items to their homes. We see a tremendous amount of community spirit to make this happen. Families are helping each other. The people have a determined look on their faces along with expressions of joy as they know now they will be living in a new structure that will keep them safe and sound. As of early September, Maryknoll, with the contributions of so many of our friends, has provided construction materials for 295 homes. Many people are creatively working on their homes and it is so inspirational to see a very positive dramatic change in the lives of these families. Besides working tirelessly to help rebuild homes in the village, we have traveled to all the schools of Bhimtar to identify the separate requirements needed in each region. Some schools lost all classrooms and offices. Other schools also lost text books. Up to and including grade 10, text books are free for students. For the higher grades, the students must buy their books. But, many students in rural villages are unable to afford the text books. They must share. It is not unusual for 10 or more students to share one book from the school library. 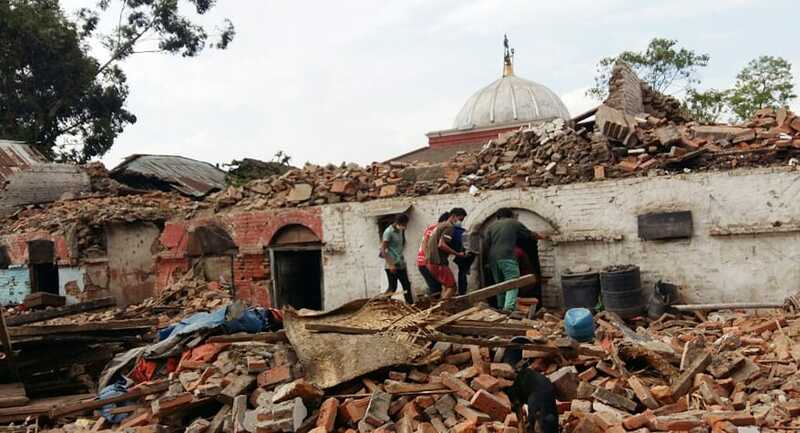 With the earthquake, the school libraries were lost, with books ruined and buried in dust, bricks and mud. Along with me and my college classmate, Frank, the Maryknoll staff brought boxes of books for the students. These books will make a major difference not just for their studies but to provide each student with the opportunity for higher education. When traveling around the village, it always is a great joy to meet the students and see how interested they are in their studies and how they can do so much with so little in their classrooms. Of course, the principals, teachers and students would like to see a better school environment. With your continued help and assistance, major changes will take place in these schools in the months ahead. Thanks so much for all the post-earthquake positive changes you are helping us bring to the families and children of Nepal.